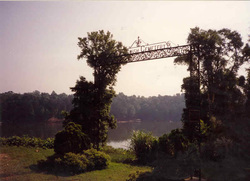 Eufaula is located in Barbour County on the Chattahoochee River in southeast Alabama. Since 1733, the site was occupied by three Creek Indian tribes of the Muscogee Nation, one of which was called the Eufaulas. White settlers from Georgia were attracted by the area's rich soil, and established a permanent settlement in the area. They adopted the Creek village's name. The Federal Road project of 1805, in which the Creek tribes granted permission for development, also encouraged white settlement in Eufaula. In 1832, the Creek ceded their land rights to the area in the Treaty of Cusseta, and Barbour County was incorporated. Jews began to arrive in Eufaula in the mid-nineteenth century, and were an important part of the town's economic development. Most of the Jews who arrived in Eufaula in the mid-19th century were immigrants from Germany, and many had traveled from other states like Florida, Georgia, and New York. The small Jewish community soon acquired land for a cemetery, with the first burial taking place in 1845. As merchants and dry goods store owners, Jews had an important impact on the local economy in Eufaula. In an 1899 news article, the Eufaula Daily Times remarked that the “town wore a rather lonesome look on the main business street” during Yom Kippur since so many of the stores were closed. Jews were involved in various kinds of businesses. Morris Beringer owned what he advertised as a “mammoth establishment” that featured “two stores in one,” selling both groceries and dry goods. 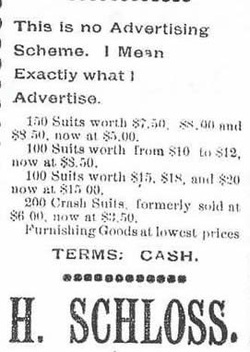 His older brother Abe Beringer owned a dry good store that boasted “the prettiest line of dress goods, silks, etc., from New York.” The partners in another business, Solomon, Bowdon & Belser, were cotton factors and commission merchants. In addition to contributing to Eufaula’s economy, Jews were also active in civic affairs. Hugo Schloss arrived in Eufaula in 1871 from Germany. Starting as a tailor in Isaac Steurman’s store, Schloss later earned enough money to open his own business, eventually becoming a successful merchant. Schloss was active in such civic groups as the Masons and the International Order of Odd Fellows, in addition to serving as a trustee of Union Female College. He also served on the city council and the board of the local bank. Despite being Jewish in an overwhelmingly Christian town, Schloss was able to create a full life for himself in Eufaula, both economically and civically. After the Civil War, the Jews of Eufaula began to pray together formally, establishing the congregation B’nai Israel. They also organized a local chapter of B’nai B’rith. In 1872, the congregation bought a building located on the corner of Livingston and Barbour Streets that had once housed the Eufaula First United Methodist Church. Since the congregation was unable to afford a full-time rabbi, J.K. Sams, a local merchant and German immigrant, led services. In 1899, the Eufaula Daily Times described the Jewish worship style as Orthodox, although by 1907 the congregation had adopted a more Reform-style practice. With thirty members in 1907, the congregation met on Friday evenings and holidays and services were mostly in English. Silas Stern, a merchant who had been born in New York, served as the president of the congregation. Despite its Reform worship style, B’nai Israel never joined the Union of American Hebrew Congregations. B’nai Israel proved to be short-lived, as the Eufaula Jewish community started to decline in the twentieth century. In 1878, by one estimate, the town had 105 Jews; by 1905, the Jewish population had declined to fifty-six. By 1937, only twenty-five Jews remained in Eufaula. Faced with this diminishing population, B’nai Israel sold its building to the R.L. Bland Coal Company in 1911. In 1919, the congregation, led by its president, Abe Beringer, only had six member households. They continued to meet in private homes until the 1930s, when the congregation officially disbanded. Despite the closing of B’nai Israel, the Eufaula Jewish community continued on thanks to the Rudderman family. In 1936, Abe Rudderman and his family arrived in Eufaula. Abe established Ruddy’s Discount Store and helped maintain the Jewish cemetery. Before his death in 1990, he bought a ten-grave family plot in the non-Jewish section of the cemetery because the Jewish section had already been filled. An enclosure surrounds the Rudderman plot in order to sanctify it. Over time, the Jewish cemetery in Eufaula fell into disrepair and was damaged by vandals. Jennie Rudderman, Abe’s wife, spearheaded efforts to raise money for the renovation. In 1987, after much work had been done to restore the cemetery to its prior beauty, a rededication ceremony was held that drew more than 125 people. Rabbi Richard Eisenberg, from Shearith Israel Synagogue of Columbus, Georgia officiated. The Jewish cemetery, located in East Fairview Cemetery, holds eighty-two graves. Descendents of Abe and Jennie Rudderman continue to be the last Jews in Eufaula. In 1999, Eufaula experienced a joyous family reunion that took place in the old antebellum home of Abe Rudderman and included thirty-five of his descendents. In 2004, the Mobile Register published a story on Sara Hamm, Abe and Jennie’s granddaughter, and her family. They are now the last Jews left in Eufaula. Sara has followed in her grandmother’s footsteps and continues to maintain Eufaula’s cemetery. She is the business manager of Reeves Peanut Co., a large wholesale shelling operation in Eufaula. Committed to instilling a Jewish education in her son Chad, she drove forty-five miles to Columbus, Georgia, twice a week, so he could attend Hebrew school and Saturday morning services. Sara grew up in Clayton, and she too attended Hebrew school in Columbus thanks to the help of her grandfather who drove her there. Hamm’s family may be the last Jewish family in Eufaula, but her efforts to preserve their heritage ensures that their Jewish identity will not be lost.